The intersection of Church Street and Orrington Avenue in the first ward. Residents of the first ward would like to see an ordinance that would be more strict on panhandling. City officials are looking to revise current guidelines on panhandling in Evanston due to an increase in resident concerns over the practice. City manager Wally Bobkiewicz said city staff will likely present amendments to Evanston’s panhandling ordinance to City Council in February or March. Bobkiewicz said that during Ald. Judy Fiske’s (1st) quarterly ward meeting in December, several residents said they would like to see an ordinance that is stricter and would prohibit more types of panhandling. 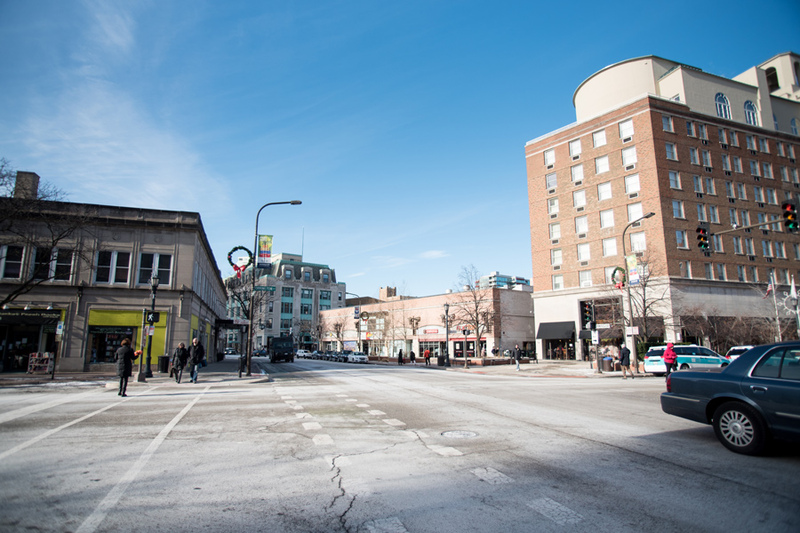 The first ward contains much of downtown Evanston, where panhandlers are known to frequent. George, who did not give a last name, said he has been panhandling in Evanston for roughly six months, and added that he has not had any issues while soliciting. In his panhandling experience, he estimates that generally one in every three people who he solicits try to help out. George believes the city shouldn’t change the way it handles panhandling. “Leave it as is. You know, if you’re not causing a problem, leave it as is,” George said. The Supreme Court ruled in 2015 that panhandling is a form of free speech protected under the First Amendment, although aggressive panhandling, as well as asking for money in certain areas, including near bus stops or within 20 feet of an ATM or bank, is not allowed in Evanston. Bobkiewicz added that there are several current court decisions around similar ordinances throughout the country in the last few years that severely restrict limitations on panhandling. “The courts see this as free speech and the abilities for local communities to very aggressively regulate it is pretty difficult,” Bobkiewicz said. Arrests for violating city codes relating to panhandling have been rare, former Evanston Police Commander Jay Parrott told The Daily in 2014. One of the more recent arrests for aggressive panhandling happened in May 2017, when a man was panhandling within 18 feet of an ATM and was charged with violating a city panhandling ordinance and disobeying the police in public. To help assist with a change in how Evanston approaches panhandling, Bobkiewicz said the city committed to look to other cities for guidance, including Berkeley and Santa Cruz in California. In Berkeley, city officials have turned from ordinances on panhandling such as the recommendation from 2015 that would have restricted panhandlers’ and their possessions’ presence on sidewalks and plazas from 7 a.m. to 10 p.m., according to the City Council of Berkeley’s action calendar from March 17, 2015. Currently, the City of Berkeley is allocating more than $2 million in excess city funds to homeless aid programs, after the contentious eviction of a homeless encampment in South Berkeley last year and the city lacking a homeless shelter for the winter. Bobkiewicz also noted the city sees a spike in panhandling at the start of the academic year. “We always see a spike in panhandlers in August and September because … some individuals see that as an opportunity with new students on campus to receive dollars from those new students,” Bobkiewicz said. Communication sophomore Allyson Snyder said she has found that panhandlers in Evanston are understanding. To Snyder, the volume of panhandling might seem high because Evanston is a smaller city, but she believes it is a lot lower than in downtown Chicago. Snyder said she thinks that people should start recognizing panhandlers as people. “They’re not rude if you don’t have change or if you don’t want to donate to them and I think that’s very different from some other places I’ve been,” Snyder said.